My name is Jessica Grandt-Turke and I am proud to be the Principal here at Harrison Elementary School. As the administrator of your child’s school, I think it’s important that you know a little bit about my background. 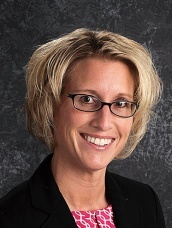 I have been an educator since 2000, and I have been a proud member of the School District of Janesville since 2002. I came to Harrison School as the Principal in 2010, and in 2013 I was recognized by the School District of Janesville as Administrator of the Year. I have three Master’s Degrees: one in Social Work, one in Education, and one in Education Leadership. I am licensed as a Principal, Director of Instruction, and a School Social Worker by the Wisconsin Department of Public Instruction. I am married and have two elementary-aged children of my own. I am incredibly passionate about the power of education and about the right of every child to a quality education. I believe it is our obligation as teachers to provide that quality education to every single child who walks through the doors of Harrison Elementary School. And if that isn’t happening, then I am not doing my job. This belief is what drives me to do what I do and what motivates me to always be looking for better ways to engage and educate our students. I also believe that before we can truly and effectively educate a child, we must first build a positive relationship with that child. I believe that it is also important for us, as educators, to build positive relationships with the families of our students. After all, we are all part of a team working together and it is only through building positive relationships that we will be able to successfully educate every child. I lead an incredibly dedicated and skilled staff here at Harrison who are all as committed as I am to providing your child with a quality education in a caring environment. We thank you for sharing your child with us and look forward to working with you to make this a successful school year. Harrison is a wonderful school and your child is in great hands.